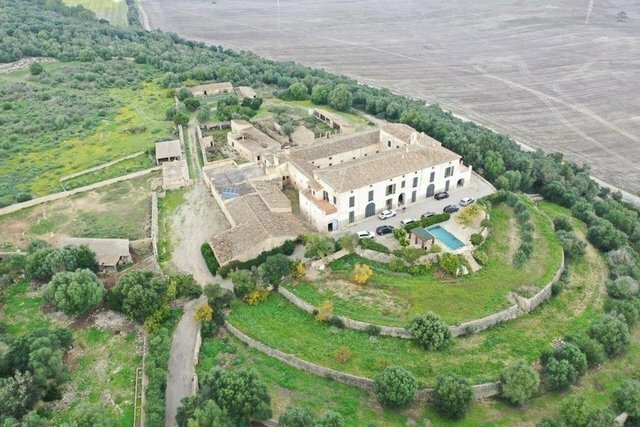 This elegant Mallorcan property, with several centuries of history, is located between the towns of Porreres and Villafranca in the centre of the island . It is very well connected, reached easily from Palma in 30 minutes and only 20 minutes from the airport. The property, located on a hill which enjoys amazing panoramic views of the surrounding countryside, has a large, stately house and several outbuildings, comprising a total built area of approximately 4,500 m2 within a 40,000 m2 plot, including a swimming pool and gardens. There is also the possibility of purchasing a further 1,700,000 m2 of land for agricultural use, wine growing etc. The property, which needs renovating , has great potential to be converted into a luxury rural hotel.